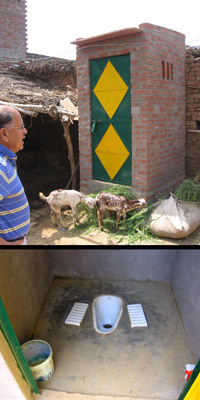 below: Sam Singh, one of the toilets already constructed, and a view of the interior of a Sulabh toilet. Karanpur is a small, poor farming village in the state of Uttar Pradesh. It is also the home of Pardada Pardadi girls school. Pardada Pardadi was founded by Virendra "Sam" Singh, a sixty-eight-year-old American citizen and chemical engineer who left India in 1960 and returned in 2000 to invest his savings in a school for girls. Eight years later, the school enrolls 700 lowest-caste girls aged 8-21 from 43 surrounding villages, teaching them academics along with health, hygiene, money management, legal awareness, and life-changing vocational skills. The practice of outdoor elimination is universal in rural India, as the villagers are too poor to afford even the low-cost Sulabh toilet. For reasons of modesty, women and girls must defecate only under cover of darkness. if you sponsor a complete toilet, he'll inscribe your name on it. Upon completion, he'll send you photos of the toilet bearing your name, along with pictures of the students and the family whose lives will change because of your generosity. Thank you for publicizing the toilet fundraiser! For more information about Pardada Pardadi and other ways in which you can get involved, please visit: education4change.org or pardada-pardadi.blogspot.com.